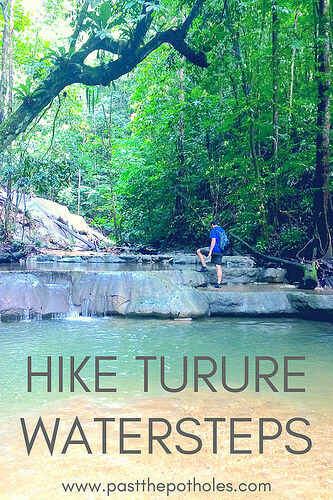 How to hike Turure Watersteps, and why you should! Turure Watersteps just might be the perfect hike. It is easy enough for anyone to complete and makes for a great family adventure. 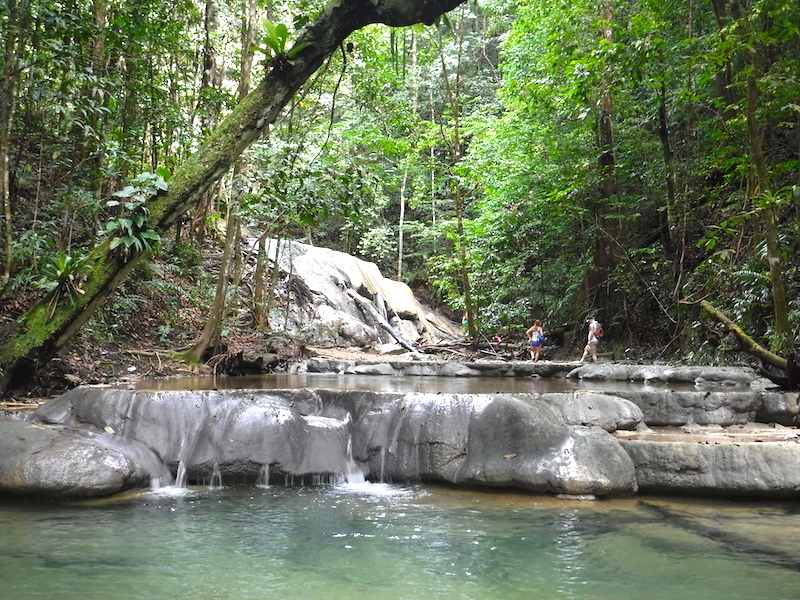 It’s a beautiful hike through jungle, along a river with a really interesting series of limestone waterfalls at the end. Sounds pretty awesome, right? If you’re heading to Trinidad and looking for more ideas of what to do, read 70 Awesome Things to do in Trinidad. 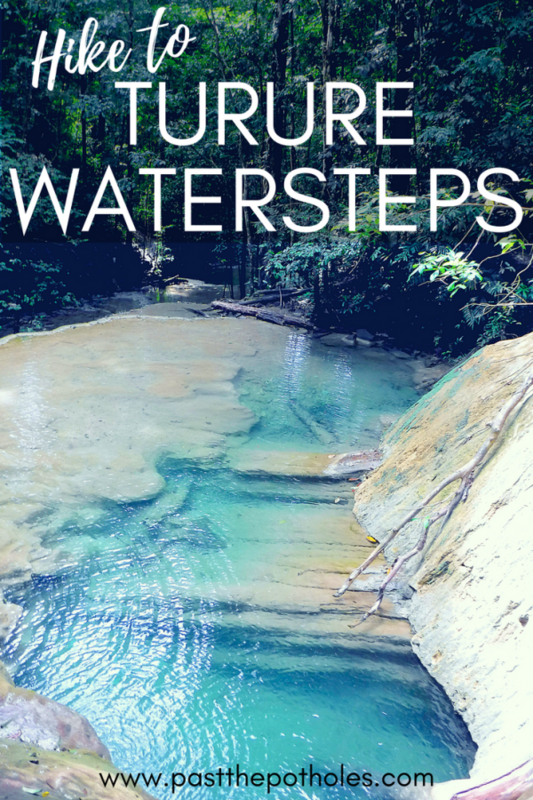 Where does the Turure Watersteps hike start? Turure Watersteps are just past Valencia. Drive east along the highway from Port of Spain to Valencia and head to the left when the road forks. As you start to leave town, turn left onto Cumaca Road. You will see signs for Valencia Eco Resort, a quarry and a ‘Save the Pawi’ sign. This road can be rough at points but any car can make, just go slow. Trust me, if our little go-kart could get there whatever you’re driving shouldn’t have a problem! Shortly after passing the quarry there will be a small bridge and the road turns sharply to the right. Park in the wider section just past the bridge. The hike begins by climbing the steep clearing to the left of the river. Once at the top the trail becomes clear. Throughout the hike, there are a number of points where you cross the river. These are the only spots where the trail can become unclear as you need to find where it picks up again on the other side. If in doubt, just remember to keep following the river upstream. 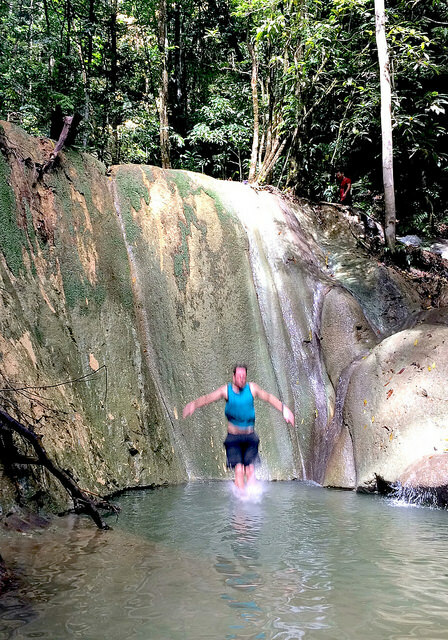 When you reach the first limestone waterfall you can cross over and climb up the side. The limestone actually provides incredible traction in spite of its slippery appearance. There are about three levels to climb up and explore with an option for further exploration upstream. The brave amongst your group will even have an opportunity to jump over one waterfall (only recommended if you have someone who knows the safe spot). How long should it take to hike Turure Watersteps? The hike takes about 45 minutes each way and is quite easy. We have hiked this with children as young as three or four who had no difficulties. There are a few spots with a slight incline but the path is easy and no hill is too steep or too long. Probably the trickiest parts are the river crossings due to the rocky riverbed. However, the water is clear so finding footing is easy and always step on the small rocks to avoid slipping. Depending on how long you choose to stay and explore, relax and eat at the watersteps, the hike will likely take anywhere from 2 to 3 hours. 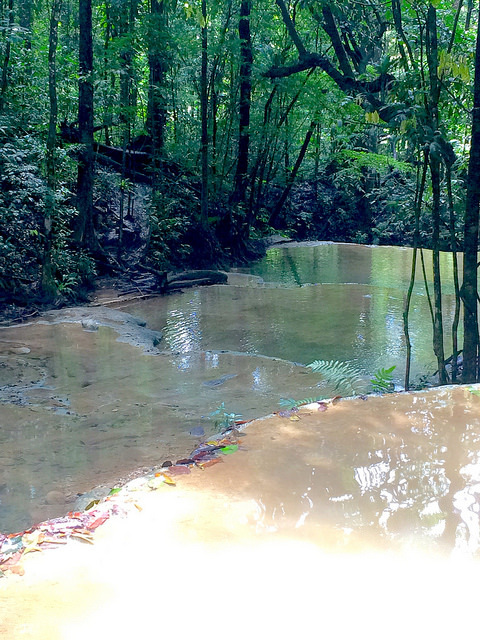 Hiking Turure Watersteps (also called Cumaca Waterfall) takes you through dense tropical jungle. There is an abundance of wildlife and you could see a variety of creatures if you are quiet and look carefully. You will almost certainly see many birds, insects and reptiles along the trail. It is best to leave first thing in the morning for this (and any) hike. 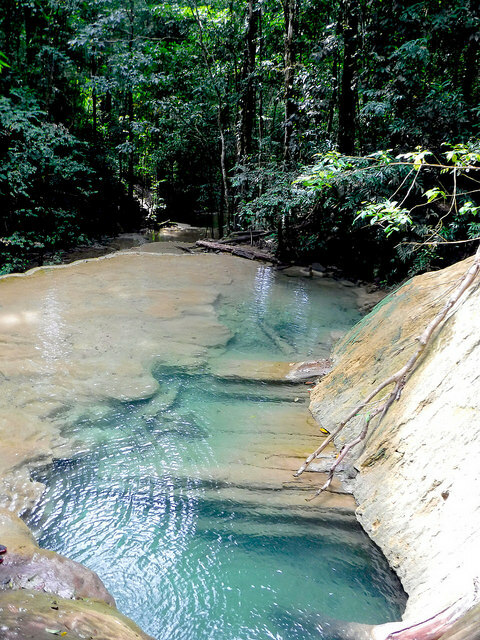 The drive is about an hour from Port of Spain and you will want to have enough time to explore and enjoy the waterfalls. This hike can be completed at any time throughout the year although the water will be the clearest, as will the skies, during the dry season – December to May. Completing this hike during the rainy season shouldn’t pose a problem but the water levels will be higher. However, you shouldn’t try to hike it if there was particularly heavy rain in the previous day(s) as it could make the trail and river unsafe as well as the water might not be clear. In the rainy season, plenty of clear water. 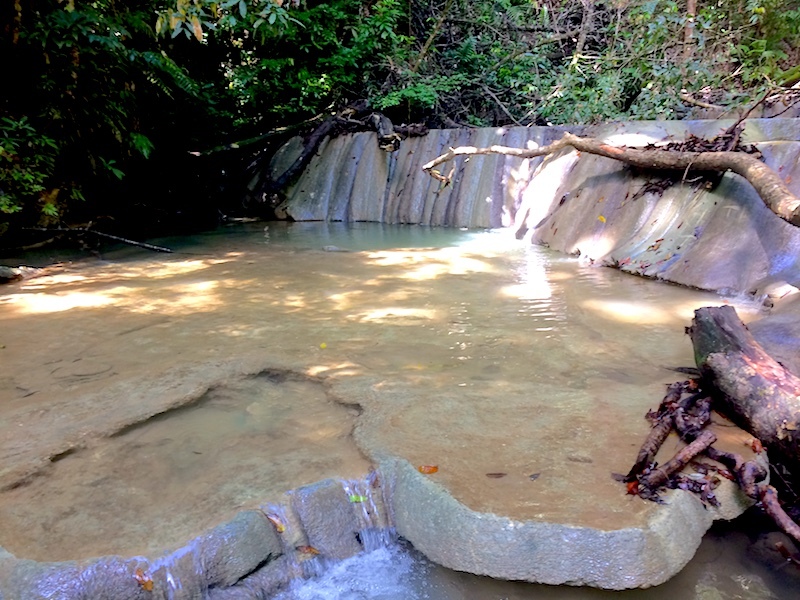 In the dry season, the waters are even clearer and a brighter blue but with less water flowing over the sides. We completed this hike once in the rainy season and once in the dry season. While it was thoroughly enjoyable at both times, the water was much prettier the second time around (although jumping was not as safe due to the lower water level). What should we wear/bring to Turure Watersteps? This hike has multiple river crossings. Waterproof hiking sandals such as Keens are perfect. Otherwise, be sure you don’t mind you your regular hiking shoes getting wet! Camera – you will want to take pictures! 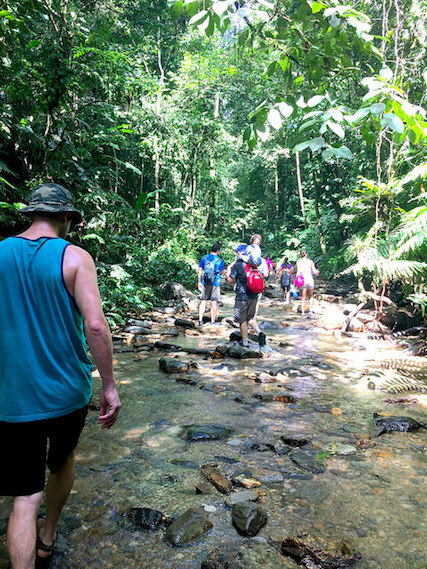 You will be hiking through humid jungle, up a river so wear light clothes and waterproof shoes! Have you done this hike? What did you think of it? 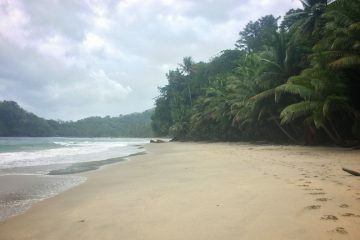 If you are interested in more hiking in Trinidad you might want to read about Paria Bay Hike, Hiking Paragrant Bay, Avocat Falls and Three Pools Hike and Hiking Trinidad’s North Coast. If you found this post useful, pin it and share with others! 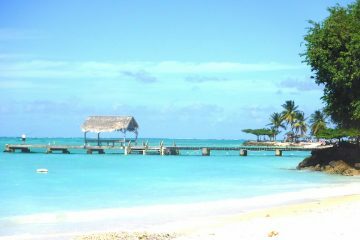 Trinidad and Tobago hasn’t much crossed my mind. It’s always great to see posts like this that open up potential for new adventures in places that were once unseen in my consciousness. It definitely doesn’t get the attention of the other Caribbean islands. We would probably never have thought twice of it without being offered a job there! Wow this place looks awesome! I’ve never been to Trinidad but definitely want to go someday and will keep this place in mind! Thanks for commenting! 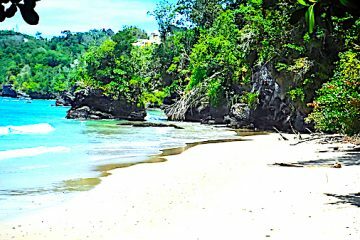 One of the best things about Trinidad is that it’s not really on anyone’s radar so everything is unspoiled. It’s definitely worth considering for a more adventurous island vacation! This sounds like my kind of thing! I also love how you’ve formatted this with the question and answer style! Thanks! I am positive this is your thing:) If you ever get the chance let me know if I can help with any planning! Wow that looks like such a cool place to explore! I’ve hiked up a waterfall before in Jamaica but it didn’t look as beautiful as this! Love that frog Claire. 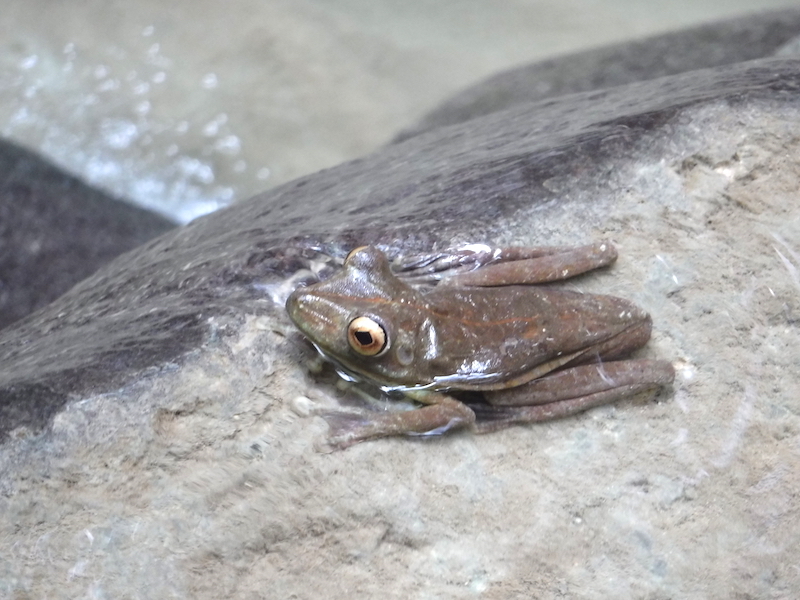 Actually, that guy is a dead ringer for the almost killed frog I seized from the cat’s mouth here in Thailand today. 2 lizards and 1 frog saved from murderous Lentil. But nature pulls me in to places like this. Watersteps rock, and toss in creatures and I am beyond sold. Way cool post. Thanks. It sounds like you’re living quite the adventure yourself!